The apple which members of an association harvested is carried to each apple place sorting fruits of JA, and it is sorted fruits by the volume of ball of the apple. In our JA, there are several places of apple places sorting fruits, but introduces a state of sorting fruits in the Iwaki apple plaza here. 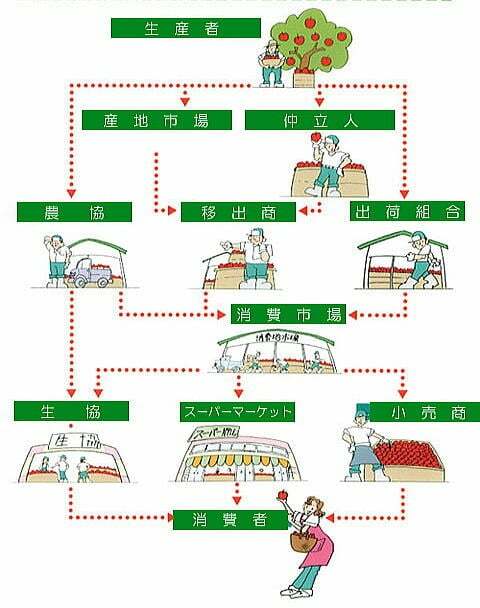 ① The apple stocked by a producer is put on the line sorting fruits together with a container. ② The container on the line is carried to the second floor with the place sorting fruits with original box supply tray ter(elevator). ③ The container carried to the second floor is sent to senkakitonyubu and a worker puts one apple on the Fried lei (bar code plate on) and can sort fruits by a machine. ④ The apple which there is possibility of the internal browning in inspects the quality of the apple with a browning sensor. ⑤ It is sorted fruits automatically in senkaki, and the apple which got on the tray is gathered up every equal rank in one place. ⑥ The apples are displayed every 1 pack and, after sorting fruits, are encased with an automatic boxing machine. ⑦ In the apple plaza, not only the sorting with the machine but also sorting fruits due to the eyes of the worker is performed. ⑧ The apple encased by a boxing machine and a worker is carried to the count down department on a line. ⑨ I check the encased apple, and there are not a difference or kind difference in rank, or one of a product does count down and closes the cap by machine if finished and waits for palette heaping up at the first-floor product pool line. ⑩ I pile up palettes automatically, and the sent product is done from the pool line by product paretaiza. ⑪ I am loaded onto a truck, and the product which piles up palettes, and was done is shipped to a market and the consumers of various parts of Japan. ⑫ The product which is not shipped immediately waits for time of the shipment with a refrigerator. In addition, the container filling apple which is not put on the line which it is stocked, and sorts fruits immediately waits for sorting fruits here. ※Facilities vary according to a place sorting fruits, and please note that it may not be sorted fruits to introduce me in less than all. Via such a course, an apple is sent to consumers.